Lynsey Ryan figured the coffee-colored, blue-eyed cat she rescued and soothed back to health was dead. Winter had been missing for three and a half years. 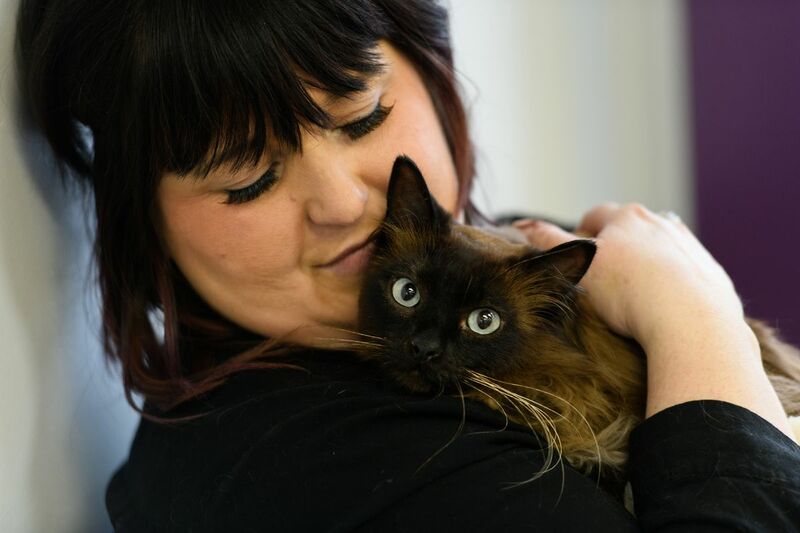 The young Himalayan breed feline that Ryan rescued from a frigid Houston home in 2014 disappeared from his new adoptive home on Joint Base Elmendorf-Richardson in August 2015. Then this month, a woman on base messaged Ryan: A stray cat she’d been feeding for months and finally caught sure looked like the one in Winter’s photo in Facebook posts on missing-pet pages. Ryan met the woman -- and the cat -- in an Anchorage parking lot and scanned the rice-sized microchip beneath his skin with a scanner she uses through her work with a Mat-Su cat rescue group. The chips, usually implanted between a cat’s shoulders via syringe, carry a number that links to a database of ownership information. Ryan was driving when her sister, Rosalyn, got the good news that the chip matched up in a message on her phone. “She slams on her brakes and we both just start crying,” Rosalyn Ryan said this week. The cat is thinner and a little skittish. He is still getting used to Ryan’s Wasilla house, and the other cats there. But he sleeps on Ryan’s bed at night and is moving out of “survival mode,” she said. Ryan cradled Winter against her shoulder on Wednesday, sitting in a chair at the Wasilla hair salon where she and Rosalyn work. Ryan first met Winter when she and another volunteer with Clear Creek Cat Rescue came to a Houston home at the request of a resident who was getting evicted. The power and heat had been off for at least a month. They found 20 cats there. The cat Ryan brought home to foster was clearly traumatized, with what looked like a chemical burn on his ear. He urinated on himself when she talked to him. Ryan kept him in the garage, patiently worked to soothe him, and brought him back to health. Within a few months, Winter was frolicking with two of Ryan’s cats. Eight months later, Ryan found what seemed like a good adoptive home on base. The cat bolted from the family’s garage within a day. They searched for a week or two, Ryan thinks, then gave up. Ryan, a civilian, couldn’t get on base to look for Winter. 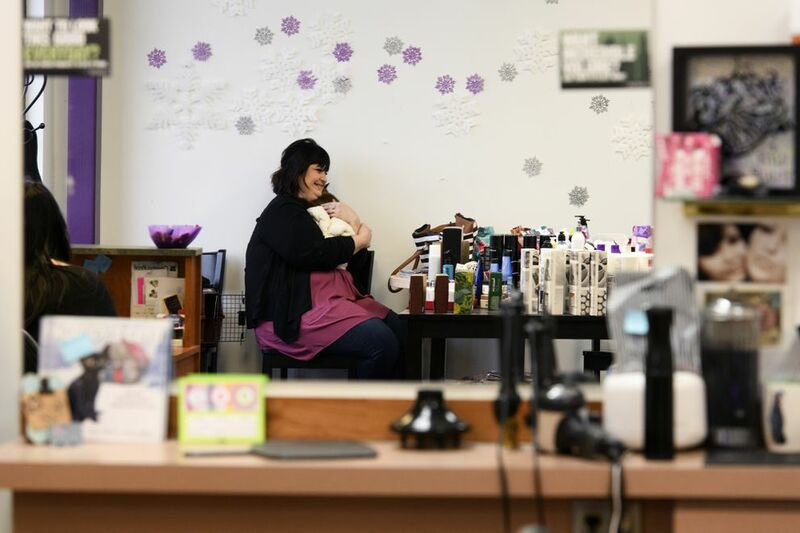 But any time one of her clients at the Hair Unlimited salon said they worked or lived at JBER, she gave them a missing-cat poster. She got a trap and found someone living near Winter’s former brief home. No luck. Someone spotted a cat that looked like Winter on Fourth Avenue a year later. Another rescue volunteer spent six months trying to trap it. No luck. Ryan told herself the cat was either with a family or dead. Probably the latter. Then, last year, a woman who lives several streets from Winter’s former home spotted a stray cat. Andrea Valero said the cat looked fat and healthy at first. “I just figured he belonged to someone in the neighborhood, but when winter came and it started to get colder, every time we’d see him he would be skinnier and I knew he was on his own,” Valero wrote in a message. She couldn’t get close enough to catch him, even after spending hours on her back in the snow by her porch trying to get the animal to come over. The cat showed up again Christmas Eve, shivering in the window. This time, Valero was able to grab the scruff of his neck and get him inside. He clearly wasn’t feral, she said: He was scared but welcomed attention and cuddles. Then Valero went on Facebook to look for missing-cat posts. She found Ryan’s. She messaged her. Ryan couldn’t believe it. She’d already let go of any hope of finding Winter. The parking lot microchip scan was the clincher: Without it, Ryan couldn’t have known for sure this was the right cat. She urges pet owners to make sure their animals have one and it’s registered. Ryan estimates that she’s provided foster care for a hundred cats at this point. She doesn’t plan to stop now. Valero thinks she might start fostering cats herself, given the happy ending to Winter’s story. She’d check for a chip right away next time. “It was an amazing and rewarding experience and I would do it again in a heartbeat,” she said.